Be prepared to hold exercises for a long slow burn with Kristen aka KK. This former D1 soccer player became a fan of the Lagree Method while living in LA and attending classes at Heather Dorak’s Platinum Pilates. Now a sideline reporter for the Utah Jazz, she craves this efficient 45 minute workout at least three times a week. 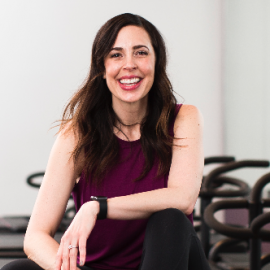 You can find Joey teaching throughout the Fitness community in SLC at Salt Lake Power Yoga, Ballet West and as our Master Lagree Teacher at PEAK|45. 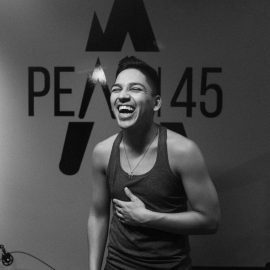 He also leads our PEAK|45 Teacher Trainings. He loves iced coffee and Fabletics … but most importantly, he loves to challenge his students on the Megaformer while making them laugh through the burn. You may recognize this name from your PEAK|45 text messages! Brooke is the one sending you emails and text messages regarding Membership Options and Customer Relations. She is now chasing around two little girls, yet finds the time to make sure you, our clients, are enjoying your time at PEAK|45. 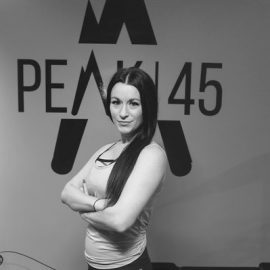 Robin brings 10+ years of fitness experience to PEAK|45. 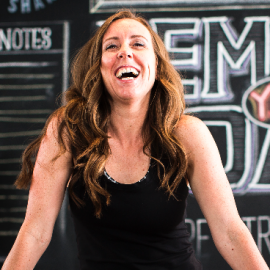 This fierce fitness expert is sure to incorporate anatomy & yoga principles into each class. She will teach you the proper form and alignment in a slower paced class. This mother of 4 inspires positivity daily, and therefore, is the perfect person to encourage positivity in the workplace. She is responsible for overseeing the quality of our classes to ensure you are getting the best experience. Her teaching is hands-on and form focused and challenging! 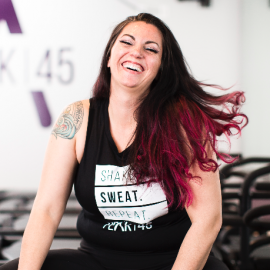 From teaching Barre and Dance to Pilates, Alison is a master at the slow burn. She will get you into activation quickly and keep you engaged for 45 minutes. She may even purr at you when you enter the shake zone! What doesn’t Tyler do? From soccer, to skiing, to slalom, she is a well rounded athlete. Her high energy spirit is contagious and sure to wake you up for a busy day! Her classes are vibrant and upbeat. Nicole is our brainiac. We call her our Scientist. She has a PhD in biological anthropology, and is sure to test your booty skills in class while blasting the bass.